A small boat, a great project. In the nautical world, “small” is relative. 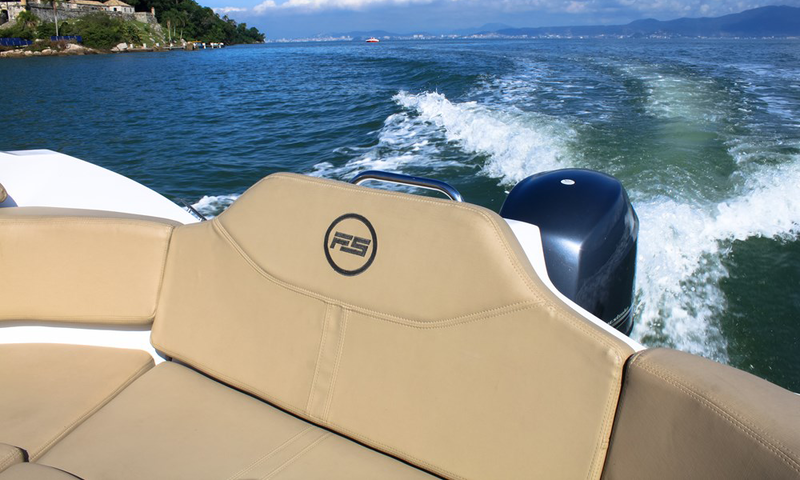 The FS 205 holds 8 persons and has the highest freeboard and the roomiest interior within its category. It has also a hull with an aggressive V profile, which is suitable not only for sheltered waters but to cut the waves comfortably. The FS 205 is nothing small. 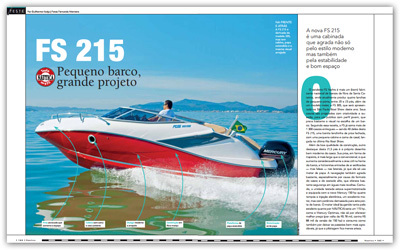 The FS 205 is the first Brazilian boat that adopted the hexagon-like bow – a foredeck with polygonal design –, which enlarges, even more, the internal space and also improves navigation since the underside of the foredeck impels the water from the waves to the sides, keeping the cockpit dry during navigation. 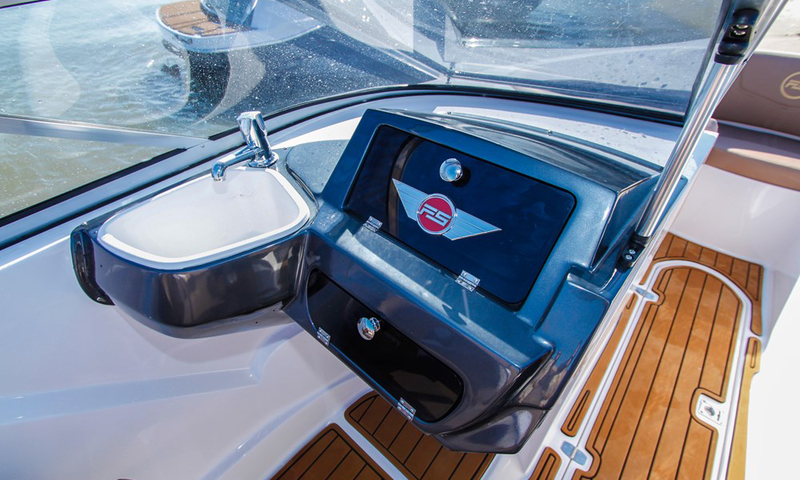 The FS 205 presents stainless steel materials, metal badges, an aluminum and glass windshield, a retractable aft sundeck, swivel seats, and several components that make it not only an appealing boat but also one with superior quality both structurally and apparently. 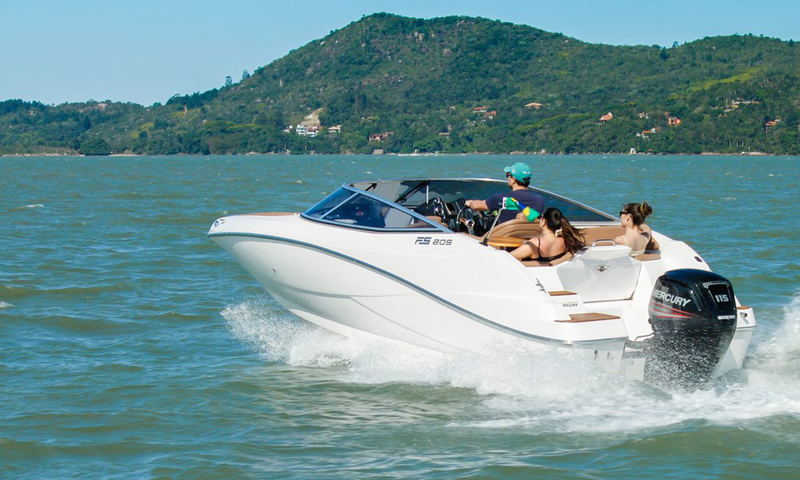 FS Yachts shipyard is one more (good) Brazilian manufacturer of fiberglass boats in Santa Catarina state. Its hulls are designed with creativity and daring, to people with a young profile that greatly values a nice look when choosing a boat. 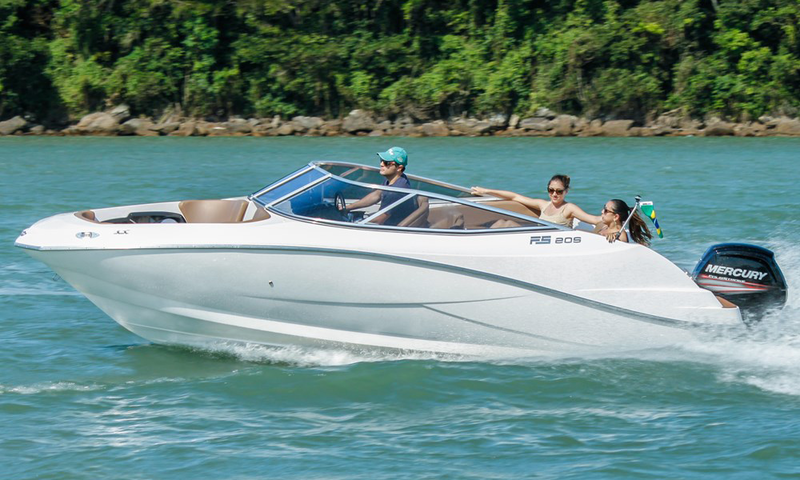 By following this recipe, FS has already delivered over 1,300 hulls, among which are forty FS 215, a beautiful, small closed-bow motorboat, with a small cabin and a double berth, launched in the last Rio Boat Show. 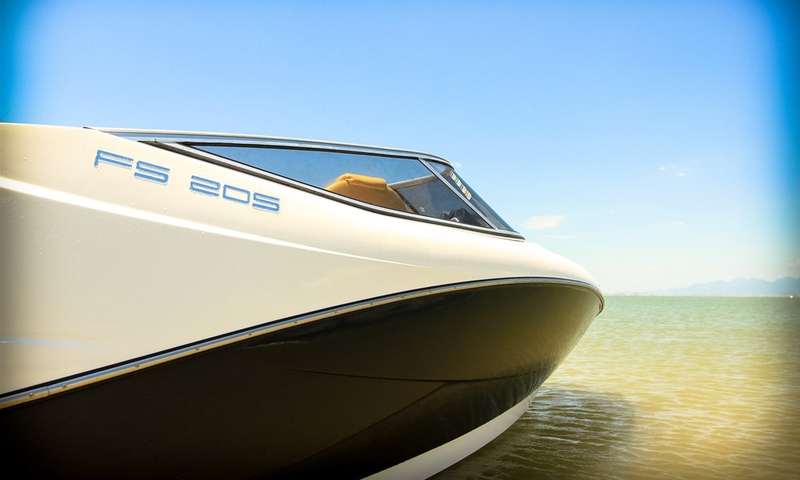 Besides the good quality of construction, another highlight of this 21.5-foot boat is the very modern design of its hull. Its polygonal foredeck is wider than usual, which considerably enlarges the usable area in the front deck. And there are beautiful, stylized air inlets on the sides, which are however faux since the boat uses an outboard engine. Its ride is also quite pleasing, mainly due to the hull shape and the freeboard height, which offer much safety on rougher waters. 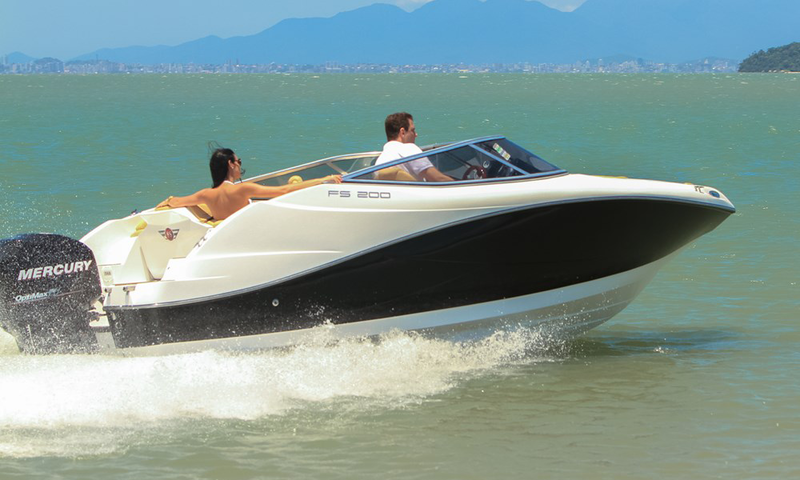 However, we have tested an over-motorized unit, equipped with the new Mercury 150-HP, four-stroke, electronic fuel injection, a great engine, but excessively powerful for such a small boat. 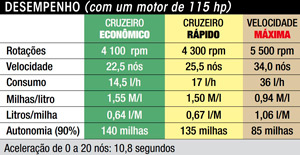 The ideal engine – suggested by both the shipyard and this magazine – would be an 115-HP engine, as the Mercury Optimax, not only for offering a better price and lower fuel consumption but also for making the rides much more pleasant since the handling becomes smoother. One of the best features of this cuddy cabin is the hull itself, which rides really well. Hard chines make the ride firm and stable, even in the sharpest turns at high speed. The aft platform gained extensions at both sides of the engine, which serve both for improving passengers boarding and enlarging the boat size itself, and allows two extra seats with backrests facing backward. 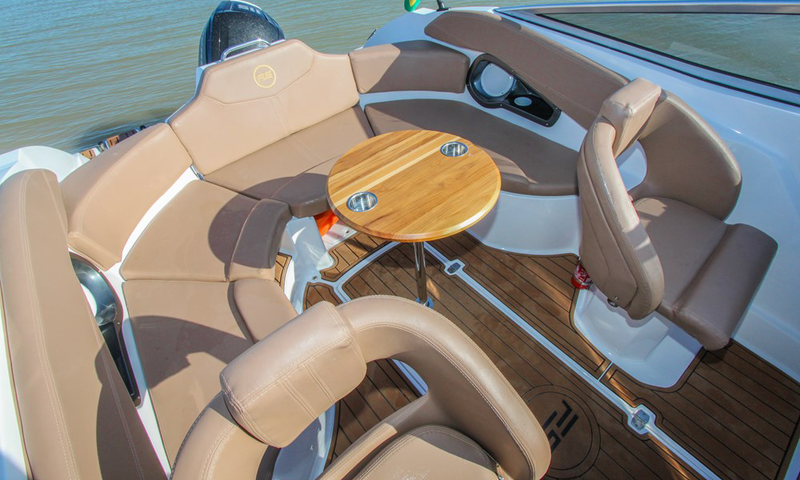 The seats of the pilot and copilot are swivel and height-adjustable, which are rare on boats of such a size. There is a small washbasin next to the glove compartment. The hexagon-like bow, by enlarging the usable space in this boat part, admits a double bed of an acceptable size, with a toilet fitted – and hidden – under it. The natural lighting and ventilation, in turn, come from two side portholes and two quite modern hatches on the ceiling. The backrest of the stern sofa can be adjusted at two positions in addition to the original one: at a 45-degree angle, for people to recline their back, or fully horizontal, thus forming an interesting little sundeck. The pilot’s seat and the companion’s seat are both swivel, and the stern sofa’s backrest is foldable. 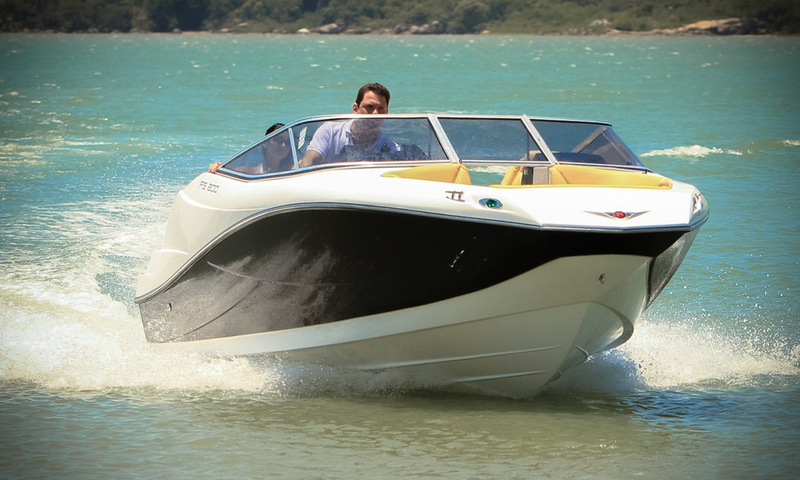 The FS 215 is one of the smallest cubby cabin manufactured in Brazil, but it competes with similar national boats that also enjoy a good reputation in the market. The difference is that the FS 215 seeks to stand out by its nice look and, in fact, it is quite appealing. It is innovative and bold, but not excessive. 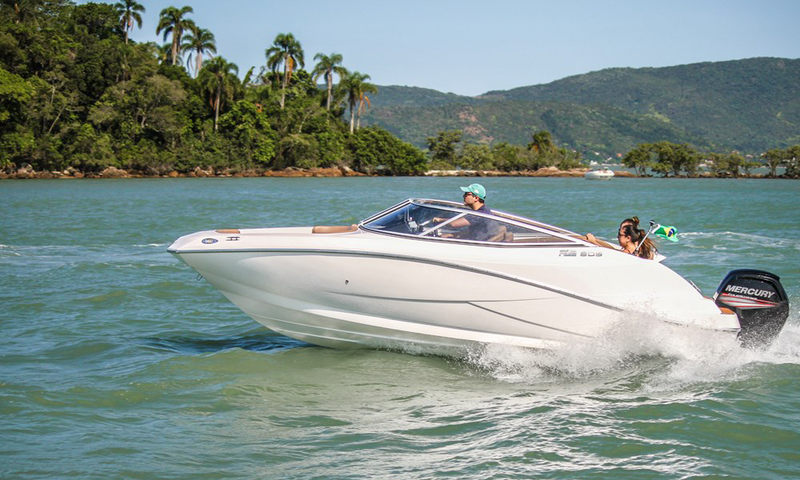 Its design follows the recent trends to straighter lines, as in the hexagon-like bow itself, which is, by the way, an unprecedented feature on motorboats of this size in Brazil. In fact, the FS 215 is only a slightly “stretched” version of the model FS 205; it has been enlarged by means of two small aft platforms that extend to both sides of the engine, but with interesting backrests facing backward for those who want to stay right close to the water when the boat is not moving. It is a good idea inspired by the wakeboard motorboats, which also offer this type of seat for those who want to follow the skier maneuvers. The proposal of this small motorboat is also to serve the purpose of couples that seek to spend one night on board, but not demanding too much comfort since the cabin isn’t high enough, although it is well ventilated through two interesting hatches of unprecedented shape on the ceiling. 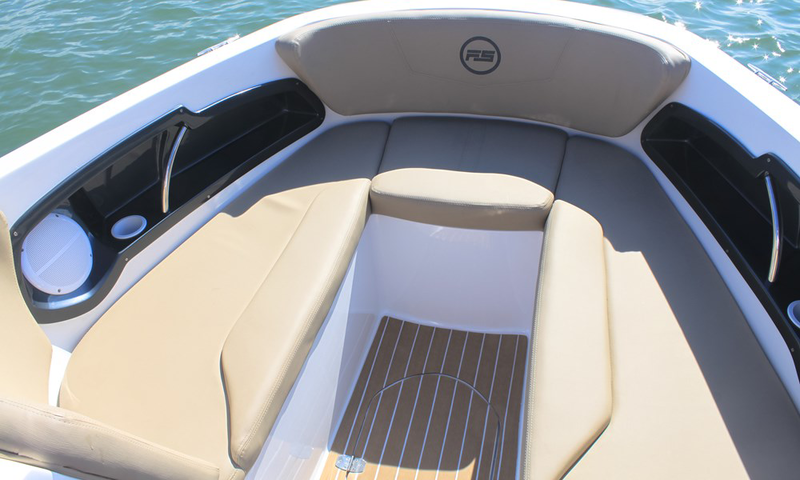 The construction and assembly quality of this boat are above the average, even for a motorboat that is reaching the market under a strong competition. In spite of the cloudy and rainy day, we tested the FS 215 without winds and on a quite calm sea. Under such conditions, we could accelerate enough and feel the effects of the – even excessive – power at the stern. The boat did better than expected. Its ride proved to be quite firm and the hull virtually did not heel, even in the sharpest turns. Also, it crossed the wakes from other boats without bumping hard and kept stable even when a maximum speed of almost 40 knots was reached. This is a direct result of the good hull bottom design with a sharp V shape ranging from an 18-degree deadrise at the stern and 25 degrees at the bow. 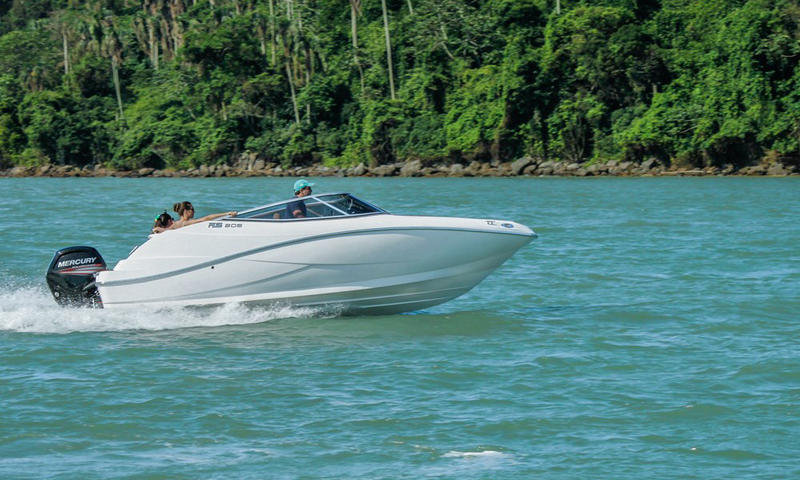 Other features that helped performance and ensured this motorboat optimum stability are both the hard chine – meaning the sides and bottom of the hull join at a sharp angle – and the well-distributed hull weight. With the tested engine, the performance marks proved to be exciting as expected, yet too much aggressive for those who just want to ride with their families. And still, with such an excessive power, an inexperienced pilot can even put safety at risk. 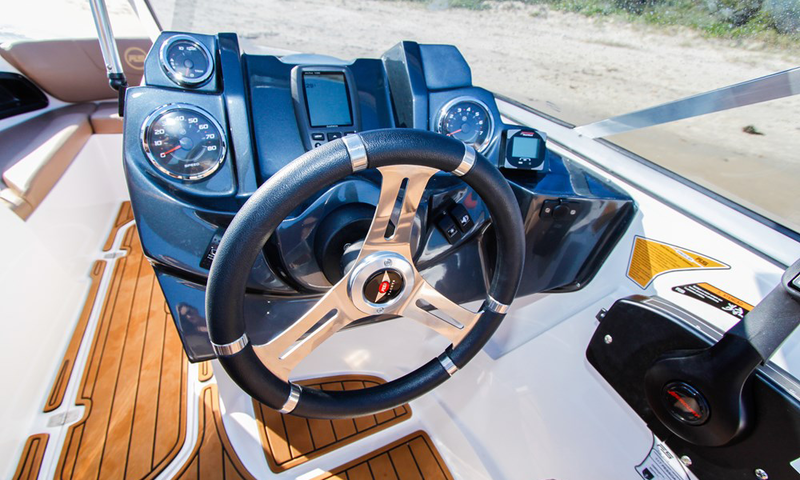 MOTORIZATION: an outboard engine Mercury 150-HP, four-stroke, electronic fuel injection; a stainless steel propeller model Mirage Plus I pace 19” and a transmission ratio of 19.2:1. The cockpit is one of the greatest highlights. Comfortable and well finished, it has swivel seats, a sofa at the stern that turns to a sundeck, and seats at the stern that face backward. With a 150-HP outboard engine, it took only 4.5 seconds to reach 20 knots and the maximum reached speed was 39.3 knots. At cruise, it reached 34.3 knots, though with a restricted range: 77 miles. Solid, manually laminated fiberglass, except for the transom, which has a marine plywood core. The frame has two stringers and four bulkheads. The electrical wiring is tinned only at the connections, but it is well installed and coded. The battery is located next to the engine, but it is unprotected from the water. The stainless steel parts are proper for boats. The cleats (2 at the bow and 2 at the stern) are of suitable size. +55 (48) 3066-1328 De segunda a sexta das 09h00 as 18h00.